Age of the Gods: Mighty Midas is part of the award-winning series of Age of the Gods progressive jackpot games from Playtech. Rich with Ancient Greek mythology and features, you’ll find the Midas Touch symbol, Gem Feature and the chance to unlock the four-tier network progressive jackpot! Playtech loves their Greek Mythology themes and as luck would have it – so do we! The strength of the slot lies in its features and a little less on its artwork. This release does not have the best graphics that we’ve seen, but we do like the audio effects which create a surreal mood. The five upper-value and two-spaces tall symbols include King Midas, God Dionysus, Silenus the Satyr and Midas’ daughter. The lower-paying symbols include a roast bird, rose, apple, chalice and grapes. The Midas Touch symbol that may appear on the third, fourth and fifth reels, points to the next symbol to the left. All instances of that same symbol transform into Golden Wilds. These wilds substitute for all other symbols except the scatter. If the Midas Touch symbol points towards a Golden Wild, then all instances become a x2 Golden Wild and likewise become a x3 Golden Wild if pointing towards a x2 Golden Wild. The Gem Feature is unlocked with a scatter on the first and fifth reels manifesting in one of five possibilities: Amber Spins, Emerald Bonus, Ruby Spins, Amethyst Spins or Sapphire Spins. In the Emerald Bonus, the reel 1 scatter reveals a cash amount and the scatter on reel 5 shows a multiplier that is applied to reach your total prize. During the Ruby Spins, a Midas Touch created Golden Wild becomes a multiplier wild using the multiplier to the bottom of a Multiplier Tower. During Amber Spins, a random symbol is selected to act like a Golden Wild for the spin. Saphire Spins add 55, 40 and 65 wilds to the second, third and fourth reels respectively on the first, second and third reels respectively. The added wilds will remain on the reels for the five Sapphire Spins. During the Amethyst Spins, the Midas Touch symbols are double stacked. As we mentioned, the slot contains four tiers of progressive jackpots: Extra Power, Ultimate Power, Super Power and Power which are pooled with other Age of the Gods progressive slots. Randomly triggered, your odds improve on higher bets. The slot presents you with a 4×5 grid consisting of 20 coins, each concealing one of the four jackpots. Flip the coins over until you uncover three identical jackpots to collect that prize. 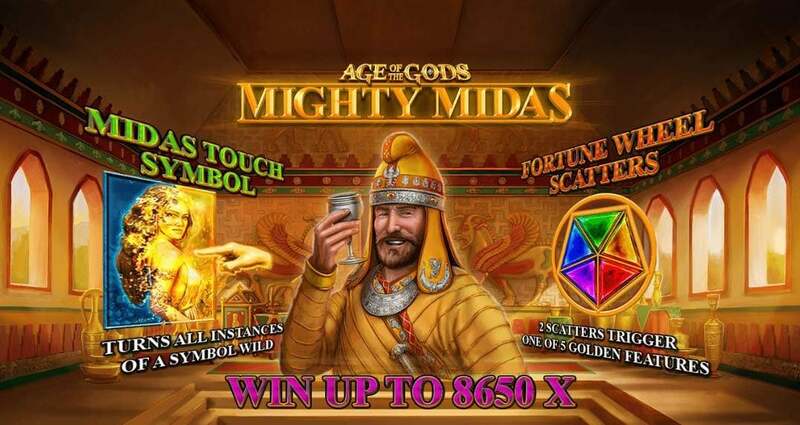 Age of the Gods: Mighty Midas slot is a high volatility slot with an RTP of 96.34%. The wagers can be adjusted from 0.40 to 2,000. This video slot game has been optimised for play on mobile, tablet and desktop. If you want to see if you have the golden touch, visit one of our recommended casinos today. 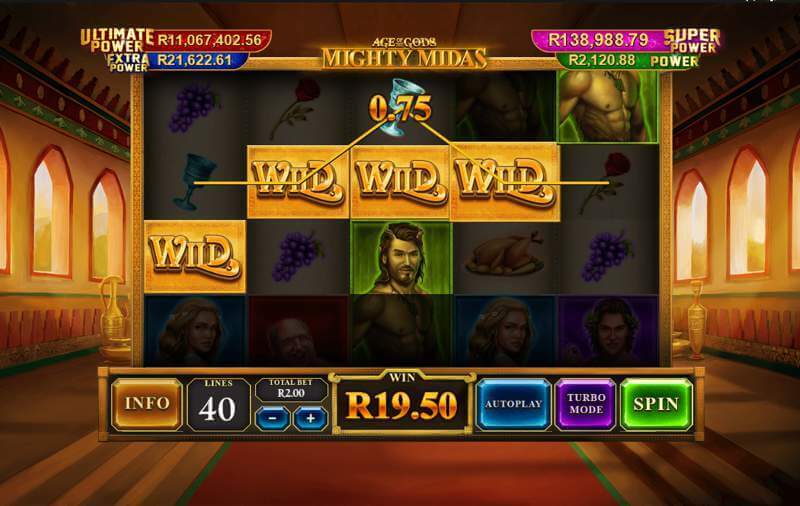 Age of the Gods: Mighty Midas video slot game is another excellent release in the Age of Gods series.